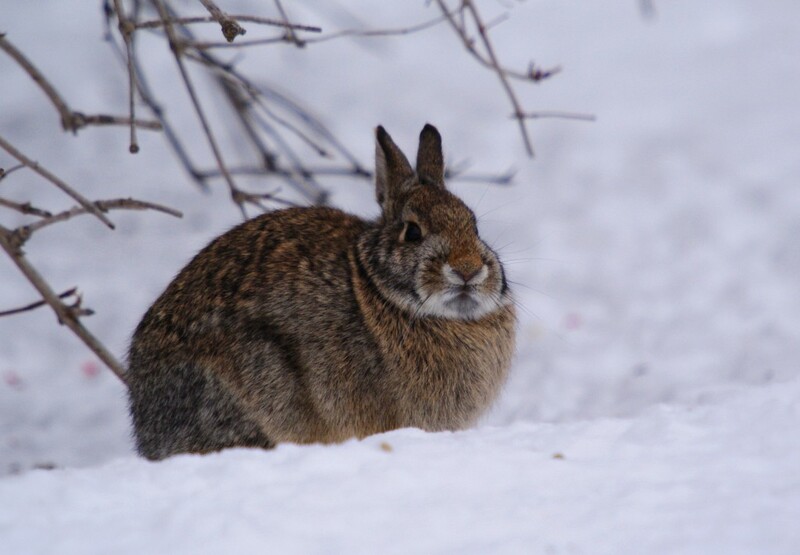 Eastern Cottontail sheltering under highbush cranberry behind Interpretive Center, 1/6/10. The above photo just about sums up how most of us in southern Minnesota feel about Mother Nature right now. Since the latter half of December, we’ve received several feet of snow and ice as a result of two or three major nationwide winter storms. Accompanying these storms, intensely cold air from the arctic has caused daily temperatures to remain steadily in the single digits to sub-zero range. Today we are receiving another four or five inches as the winds increase, severely decreasing visibility and sending wind chills into the -20’s and even the -30’s. Let’s hope that these temperatures aren’t here for long; indeed, a warm-up is forecast for next week (with highs possibly reaching the upper 20’s!). For us humans, these conditions equate to dangerous road and sidewalk conditions, higher heating bills, and significantly more time spent indoors. For wildlife, these conditions mean life or death, and only those plants and animals with adaptations to such a cold, harsh environment will survive. Mammals that don’t undergo some form of winter sleep often develop thick winter coats to help insulate against the freezing temperatures. Small birds make more frequent visits to bird feeders to help maintain their bodies’ core temperatures.